Stay Smart in Charleston South Carolina Year round you can enjoy all Charleston has to offer. Charleston is a great place for a weekend or an extended family vacation with year-round cultural events and attractions that everyone will enjoy. Southeastern Wildlife Expo Cooper River Bridge Run Flowertown Festival Family Circle Cup/ Tennis Spoleto Festival This Beautiful New Holiday Inn Express Hotel & Suites is located in South Carolina&regs largest shopping district and fifteen minutes from Charleston&regs historic downtown. Our hotel is packed with amenities&reg fitness center, seasonal outdoor pool, business center, spacious guest rooms, high speed Internet throughout, Jacuzzi suites, and meeting and banquet facilities. 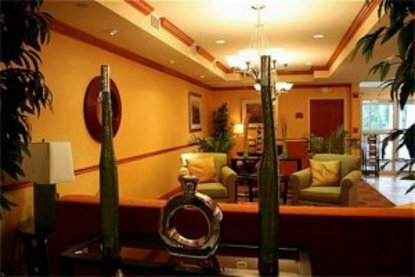 Perfect for the business traveler and leisure traveler alike, Stay Smart at the Holiday Inn Express Hotel & Suites - North Charleston Highway 78. This hotel is committed to providing accessible facilities under the American Disabilities Act. If your accessibility needs are not met, please contact the Hotel Manager on Duty. Should you require additional information regarding accessible facilities for guests with disabilities, please call 1-800-Holiday (U.S. and Canada) or contact the hotel directly. For the hearing impaired, TDD service is available at 1-800-238-5544 within the U.S. and Canada.